Here is the first anthology to present a full range of multilingual poetries from Latin America, covering over 500 years of a poetic tradition as varied, robust, and vividly imaginative as any in the world. Editors Cecilia Vicuna and Ernesto Livon-Grosman present a fresh and expansive selection of Latin American poetry, from the indigenous responses to the European conquest, through early feminist poetry of the 19th century, the early 20th century "Modernismo" and "Vanguardia" movements, later revolutionary and liberation poetry of the 1960s, right up to the experimental, visual and oral poetries being written and performed today. 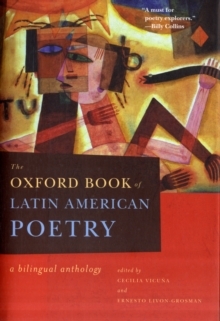 Here readers will find several types of poetry typicallyoverlooked in major anthologies, such as works written or chanted in their native languages, the vibrant mestizo (mixed) creations derived from the rich matrix of spoken language in Latin America, and even the mysterious verses written in made-up languages. In addition to the giants of Latin American poetry,such as Cesar Vallejo, Vicente Huidobro, Pablo Neruda, Octavio Paz, Haroldo and Augusto de Campos, and Gabriela Mistral, the editors have included a selection of vital but lesser known poets such as Pablo de Rohka, Blanca Varela, and Cecilia Meireles, as well as previously untranslated works by Simo n Rodriguez, Bartolome Hidalgo, Oliverio Girondo, Rosa Araneda, and many others. In all, the anthology presents more than 120 poets, many in new translations-by JeromeRothenberg, W.S. Merwin, and Forrest Gander, and others-specially commissioned for this anthology, and each accompanied by a biographical note. The book features both English and original language versions of the poems, a full bibliography, and an introduction by the editors. Sure to stand as the definitive anthology for decades to come, The Oxford Book of Latin American Poetry remaps the territory, offering new ways of looking at a poetry as diverse and complex as Latin America itself.